Now, the Diavel has more assertive outlines and higher performance, is more fun on mixed-road routes and even more comfortable, for rider and passenger alike. Its sport naked soul is magnified by a Testastretta DVT 1262 engine that combines breath-taking acceleration with the smooth low-rev power delivery that is ideal for everyday rides or longer-lasting tours. An upgraded chassis set-up makes the Diavel 1260 more responsive on mixed-road routes while high grade technology and electronics provide braking performance on a par with that of a sport bike (and does so safely, thanks to Bosch Cornering ABS) and user-friendly engine performance control. Comfort levels for rider and passenger remain outstanding thanks to, first and foremost, an upright riding position and a large, generously padded seat. The beating heart of the new Diavel 1260 is the 1262 cm3 Ducati Testastretta DVT engine with variable cam timing. Already widely appreciated on the XDiavel, it has now been upgraded to optimise performance and equipped with chain-type final transmission. This engine also provides a clean, classy side view with a quality finish, establishing it as the core of the bike also from a style standpoint. The twin-cylinder Diavel 1260 puts out 159 hp (117 kW) at 9,500 rpm* and 129 Nm (13.1 kgm) at 7,500 rpm, delivering steady pulling power right from the low-medium rev range to ensure a robust engine response as and when needed. Thanks to a variable timing system which acts continuously on the intake and exhaust camshafts, the engine adjusts power delivery to suit riding conditions: extremely smooth at low revs, assertively sporty at high revs. The riding position and ‘power cruiser’ ergonomics so popular with first-generation diavelisti remain unchanged. What has changed is the chassis set-up. 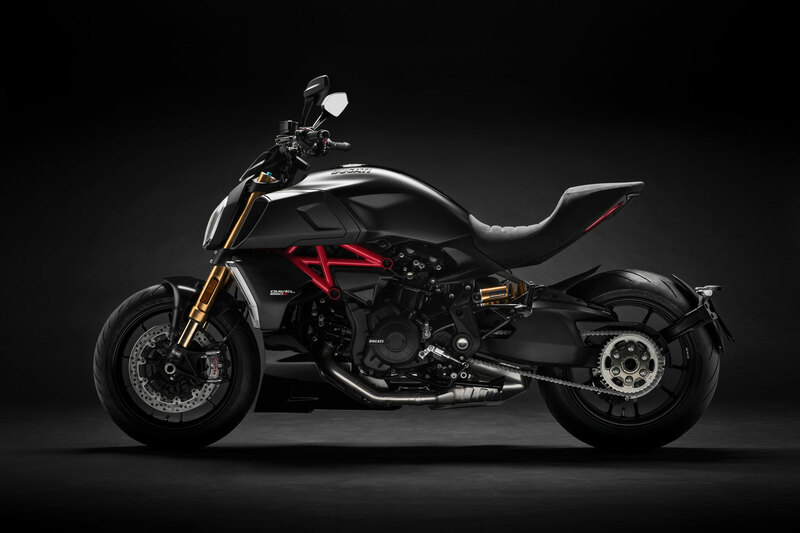 The new Diavel sports a prominent new tubular steel Trellis frame. Anchored to it is an aluminium swingarm, sized to give surprising cornering agility, superb ‘feel’ and easy riding. 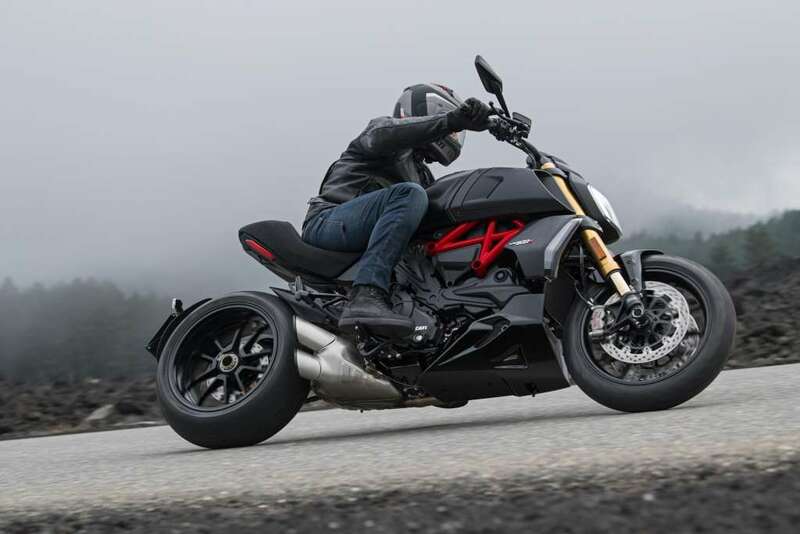 The rear wheel – 240 mm wide with a diameter of 17 inches – remains a Diavel hallmark and, together with the new chassis set-up, merges excellent handling and lean angles with outstanding comfort levels. The electronics package includes Bosch Cornering ABS EVO, Ducati Traction Control (DTC) EVO, Ducati Wheelie Control (DWC) EVO, Ducati Power Launch (DPL) EVO and Cruise Control. This new Diavel 1260 is also compatible with the Ducati Link App: this lets riders set ‘journey mode’ (a combination of Load Mode and Riding Mode) and personalise the parameters of each individual Riding Mode (ABS, Ducati Traction Control, etc.) in a user-friendly manner via their smartphones. This versatile App also provides comprehensive maintenance deadline info, a user manual and a Ducati Store locator. Furthermore, the Ducati Link App lets riders record performance and routes so they can share their new Diavel experiences with the Ducatisti community that already uses the App. o Fully adjustable Öhlins shock absorber. *116 kW (157 hp) @ 9,250 rpm for the USA version. What’s more, the Thrilling Black & Dark Stealth livery of the Diavel 1260 S offers an eye-catching contrast between the ‘total black’ look of the bike and the red frame at its centre, making the classic Ducati Trellis frame the aesthetic hub of the bike. 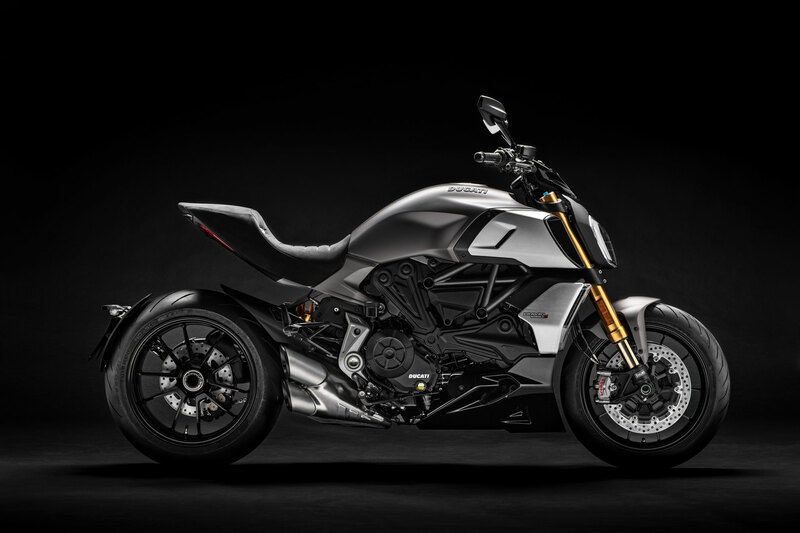 The Diavel 1260 is powered by the twin cylinder 1262 cm³ Ducati Testastretta DVT with Desmodromic timing that made its debut on the XDiavel. New mappings now ensure sportier power delivery and final transmission is of the chain type. Thanks to Desmodromic Variable Timing (DVT) this twin cylinder Ducati engine ensures extremely linear torque delivery even at low revs and sport bike performance at high revs. This is because the DVT system independently varies the timing of both the intake and exhaust valve camshafts thanks to the adoption of a valve timing adjuster, applied on the ends of each of the two camshafts. maximum torque is 129 Nm at 7,500 rpm. Fuelling – performed by a Bosch electronic injection system with elliptical throttle bodies (56 mm diameter equivalent) – is managed via a full Ride-by-Wire system. The Diavel 1260 exhaust is a 2-in-1 system with a chamber-type body and two tail pipes. Exhaust pipe routing deliberately leaves the engine in view; likewise, the central body has been positioned in front of the rear wheel, making it practically invisible. Constant investment in quality – ensured by design, advanced materials and cutting-edge engineering – allows Ducati to provide highly competitive maintenance scheduling; routine maintenance intervals have been extended to 15,000 km (or one year) and valve timing adjustment to 30,000 km, providing clear advantages for customers. This has been achieved by employing special materials for valve seats, improving combustion efficiency and containing the running temperature of the Testastretta DVT engine. Moreover, the innovative DVT system does not in any way complicate the valve timing adjustment procedure. Ducati Traction Control (DTC) is a race-derived system that acts as a filter between the rider’s right hand and the rear tyre. Within the space of just a few milliseconds the DTC can detect and subsequently control any wheelspin, improving bike performance and active safety considerably. This system has 8 different intervention levels. Levels 1 and 2 are specifically intended for sports-style riding and allow for high levels of rear wheelspin. Levels 3 to 6 ensure excellent grip on dry asphalt while levels 7 and 8 are designed to maximise grip on wet tarmac. 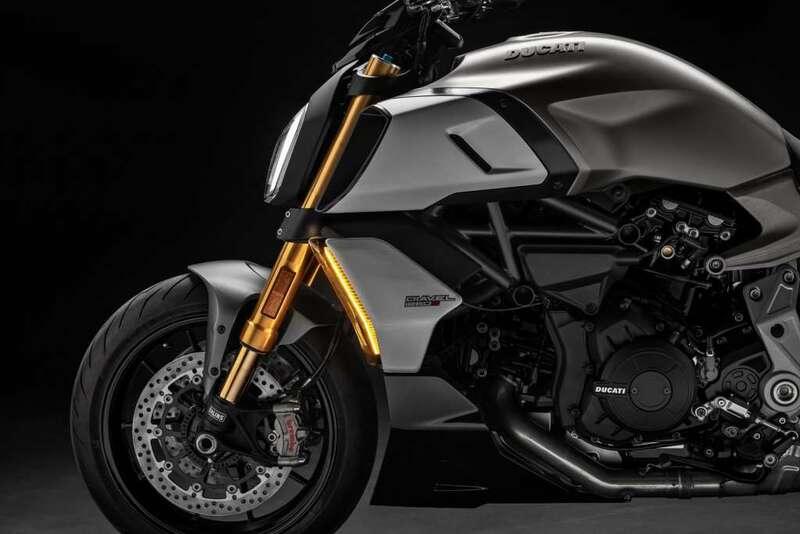 The “Dragster” coiled within the Diavel 1260 can be unleashed thanks to Ducati Power Launch (DPL). This system guarantees awesome – yet safe – starts thanks to optimised control of the maximum available torque with DTC always on and constant monitoring of the pitch angle by the IMU. DPL has three different modes, Level 1 being the one that provides maximum performance. DPL is activated by pressing the dedicated button on the right switchgear. Once it has been activated the rider can select the intervention level via the settings menu on the dashboard. After selecting the desired level the rider has to squeeze the clutch lever, engage first gear and twist the throttle wide open. Simply by releasing the clutch gradually the bike will perform a lightning-fast start as the DPL system controls engine throttle aperture. To protect the clutch, a specially developed algorithm allows only a limited number of consecutive starts. The number of ‘launches left’ returns to its normal status once the user rides the bike normally. 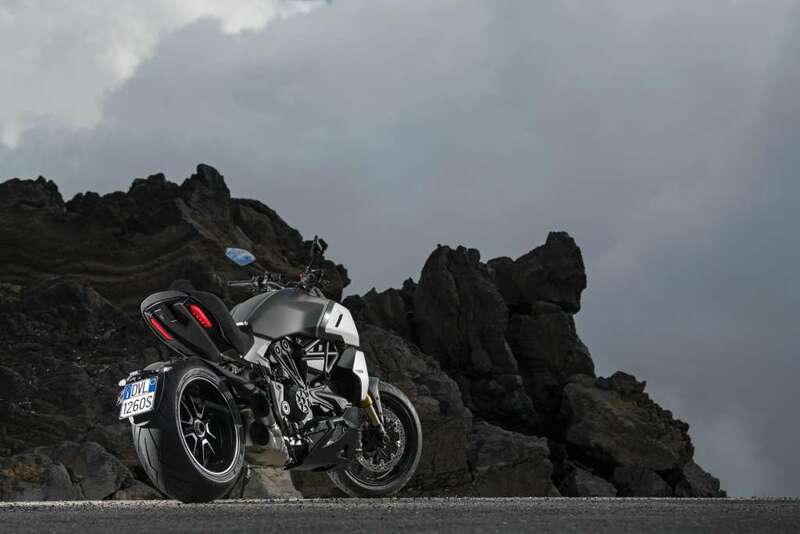 The Diavel 1260 mounts a Brembo braking system and a Bosch 9.1MP Cornering ABS control unit. Cornering ABS uses signals from the Bosch IMU platform to optimise front and rear braking power, even in critical situations and when leaning into bends. Through interaction with the Riding Modes, the system provides solutions suitable for any situation, riding condition or rider preference. The system has three different intervention levels. Level 1 offers maximum sports riding performance, disables the Cornering and rear wheel lift detection functions and allows rear wheel drift during braking as ABS is applied at the front only. Level 2 ensures a balance between front and rear: rear wheel lift detection is disabled but the Cornering function is applied and calibrated for sport riding. Level 3 optimises braking action: rear wheel lift detection is enabled and the Cornering function is on and calibrated for maximum safety (safe & stable configuration). connecting a smartphone to the dashboard lets the rider see and handle incoming calls/text messages on the screen and display info on any music being listened to. The Diavel 1260 lights are the result of meticulous design. Both front and rear – full-LED units on the S version (in countries where they are permitted) – have been designed to maximise lighting efficiency. The headlight automatically shifts from its daytime configuration to the night-time one thanks to a dashboard-mounted sensor. This function can, where desired, be deactivated to allow manual operation. Moreover, the Diavel 1260 S headlight features the DRL (Daytime Running Light) system (in countries where it is permitted). The DRL is a special side light that ensures perfect vehicle visibility during the day while making, thanks to its upside-down horseshoe shape, the XDiavel instantly recognisable even in broad daylight. The Diavel has a Hands Free system that allows ignition without a mechanical key. All you need to do is have the electronic key in your pocket… and walk up to the bike. Once you’re about 1.5 m away, the bike recognises the key code to allow ignition. At this point just press the key-on button to power up the control panel and then start the engine. This system includes an electrical steering lock actuator. The Diavel 1260 features a steel tubular Trellis frame that employs the Ducati Testastretta DVT 1262 as a stressed chassis element. It is attached to the engine at the two cylinder heads, as is the cast aluminium subframe. 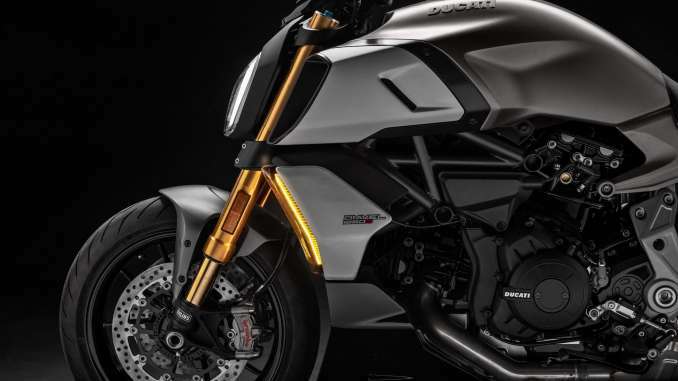 Also attached to the engine are two forged aluminium plates that embrace the die-cast aluminium single-sided swingarm.. With its 1,600 mm wheelbase, agile chassis geometry and ability to reach lean angles as steep as 41°, the Diavel’s mixed-road performance is just what you’d expect from a Ducati thoroughbred. Up front, the Diavel 1260 mounts fully adjustable 50 mm forks. Damping compression and spring pre-load adjustment are on the left fork tube, while rebound adjustment is located on the right tube. At the rear, instead, the Diavel 1260 mounts a monoshock with adjustable spring-preload and damping rebound. grip two 320 floating discs. At the rear, instead, a 265 mm disc is braked by a 2-piston caliper, again made by Brembo.